The installation of Showcases at the hotel obtained the Silver Prize in the Event Venues & Hospitality category. 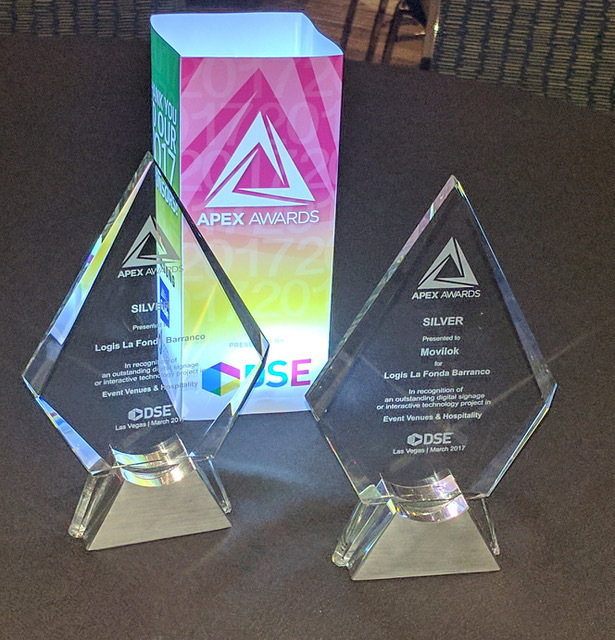 Movilok was awarded with the Silver Prize at DSE ApexAwards 2017, held past 29 March at Hotel Renaissance in Las Vegas, for the installation at Hotel Logis La Fonda Barranco, Jerez de la Frontera (Spain). Digital Signage Expo (DSE) is one of the main global exhibitions focused on digital signage, interactive technologies and digital communications networks. This year, the awards were individually assessed and juried on the basis of originality and innovation by 10 industry experts and journalists. Finalists were divided in nine categories from a field of 138 entrants from 12 countries. Movilok obtained its Silver Prize, behind Dimensional Innovations, awarded with the Gold for its project “The Vikings Voyage” at US Bank Stadium in the “EventVenues & Hospitality” category. Luis del Ser, co-founder of Movilok commented that “this prize fills us with joy and reinforces us to keep on working and improving our platform, has obtained an international dimension”. Movilok took part in this 13th edition of the DSE Apex Awards 2017 presenting the installation of Showcases at Hotel Logis La Fonda Barranco, first hotel certified in Spain for the hearing impaired. It is a picturesque hotel, in what it used to be an ancient house of merchants in the town center of Jerez and only one step away of all the touristic attractions in the city. In this context, the Awards jury took into account the application of Movilok Showcases as a response to the challenge of improving communications by means of digital signage, providing clients with valuable touristic information, in their own language and in an interactive way, as described in this video. For the second year, Movilok will be as exhibitor at the International Tourism Trade Fair FITUR 2017, to be held in Madrid from January 18-22. There, we’ll show how Showcases is able to enhance customer experience in tourism business, specially in hospitality, catering sector and travel agencies. Sometimes we find digital signage equipment suffering from temporary errors, not playing the configured content, showing frozen content or their OS screens. The error usually persists until some person in charge is noticed and solves the problem or calls for support. This may involve longer downtimes, specially when equipment is deployed in multiple locations or facilities. These problems mean a loss of advertising impact and a significant decrease of the brand image. Movilok Showcases now provides a new player management system, integrated in the existing Showcases management console, which allows our clients to know the status of each player device in a remote and centralised way, and which is also able to send a notification when a device stops working. Detect and change the showcase shown by the player. Detect the geographic location of the player device. Change the “beacon” advertising configuration. Change the “Face detection” configuration. Detect if there is a user connected to the showcase. With this management system, device maintenance and problem solving times may be minimised, since real time information and remote management features for every player are available. Since its conception, Movilok Showcases has supported digital coupons in its interactive showcases, which can be downloaded to the users’ smartphones and manually redeemed in participant establishments. Now, Showcases integrates a new dynamic coupon system, able to manage the full cycle of coupon generation, distribution and redemption. Our clients will be now able to create coupons, that will be distributed by Movilok Showcases displays, downloaded to the users’ smartphones according to configured limits, and automatically redeemed by authorised third party establishments. Now, the coupon administration system is able to generate reports of downloaded and redeemed coupons. Besides, the system is able to register users who download a coupon, providing valuable contact information for eventual commercial actions. Security is one of major concerns to install digital signage equipment in unattended locations, such as hotel rooms, where lost & damage issues are frequent. Movilok shows in FITUR 2017 the new security module to host Showcases players. This module is integrated between the TV set and its wall support. The security module is designed to prevent access to the player device, thus increasing security in these types of locations and reducing maintenance costs, while allowing to provide customers with our interactive catalog of products, services and recommendations. The security module can host Showcases player devices with “stick” form-factor, and is compatible with a wide range of standard TV wall supports. 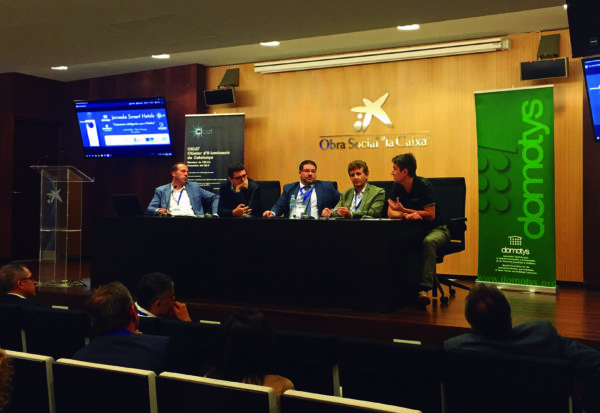 Movilok, in collaboration with LOGIS La Fonda Barranco Hotel, presented the first real case of Showcases for the hospitality sector, at the event Smart Hotels – Soluciones inteligentes para Hoteles , held on October 4th in Palau Macaya – Barcelona. 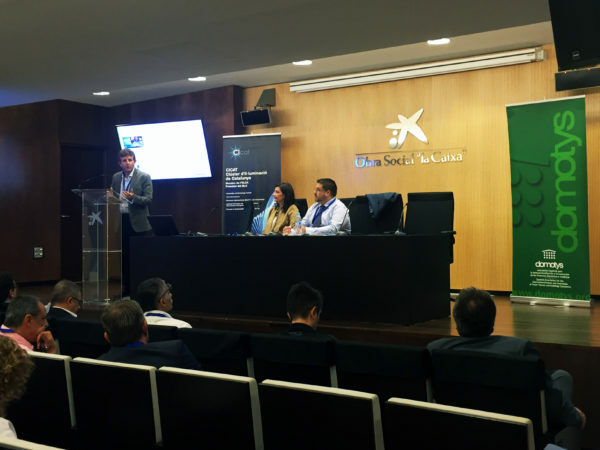 The event, hosted by Domotys, CICAT and SmartLivingPlat, has the aim of spreading the news that new technologies can enrich customer experience in such a key sector for the Spanish economy, and how hotels can improve their management and efficiency. Luis del Ser – Co-founder of de Movilok, gave a speech on “Interaction Point between customers and touristic environment”, exposing his vision about how the interaction between the hotel and its visitors can be improved by means of technology, and which features of Movilok Showcases can be applied to the hospitality sector. Using Showcases, any smartphone with an internet connection becomes a remote control of the information point – the display – , without the need of an app. Virtually any digital screen can be used as Showcases display, either autonomously or integrated with existing digital signage solutions. Customers can interact bidirectionally with the contents on the display, sending information to the system and receiving data – promotions, discount coupons, directions… – in their smartphones. Improves the quality of customer service, extending office hours to 24×7 and showing information in the customer’s language, since the system detects the smartphone language. Allows customers to keep the most relevant information with them, downloaded in their smartphones. Allows the hotel to promote certain activities in their portfolio, as well as other stores and business with a commercial agreement. Provides tools for better customer knowledge, by means of usage statistics or satisfaction surveys. It is a great support in accessibility strategy, for deaf people in the specific case of this hotel. Provides a simple content management with no need of third party agents. The following video is a real demo of how Showcases can be applied to the reception of a hotel. Please switch English subtitles on for translation. Madrid, September 21th, 2016. Movilok, Spanish mobile solutions provider with more than 15 years presence in the market, launches Showcases, an interactive showcase solution that enriches the experience of customers going to a commerce or shop. This technology transforms any display (TV, LED screen, videowall) into an interactive experience. Interactivity is achieved by means of a mobile device, acting as the display remote control. This solution is functional even without a dedicated application installed in the mobile device, using the phone web browser. That way, virtually any smartphone in the market is enabled to use this solution. Using this interactive digital signage solution, the customer can choose and filter content, download the commerce detailled offers or send information, all in real time. Luis del Ser, Movilok co-founder, explains: “This solution is designed to meet both large companies and small business needs, in sectors such as retail, tourism, banking, real estate or automobile that wants to offer an enriched experience to their customers using an interactive access to their digital signage”. He adds: “it is simple, easy to install and it is not bound to any specific hardware, allowing to choose the devices more adequate to the commerce provided their performance and cost”. Unlike a touch display, this solution can be used both inside the shop and for external public, urban furniture or even stadiums displays. The interactive digital signage is offered by Movilok as a cloud service with a periodic subscription. It gathers usage and query statistics, allows the showcase owner to learn which products or services are more frequently visited and awake more interest. 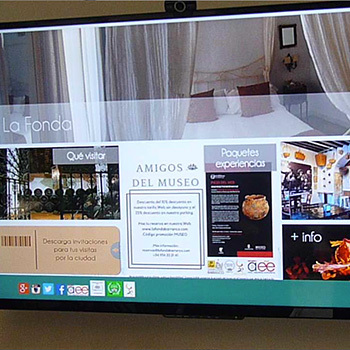 Quoting Luis del Ser: “any shop owning a common display such as an HD television and a device able to connect to the Internet and browse the web, such as a PC/Mac or chromebox can enjoy Showcases advantages”. To connect to a showcase, a user only needs a common smartphone and its web browser. Mobile Apps (Android and iOS) are also available to allow QR readings and showcase navigation. Helping customers to decide on what to buy inside the shop. Using the physical shop proximity to create exclusive interactive experiences by combining both physical and virtual worlds, attracting and getting through to the customer. Movilok is a mobile solutions provider with 15 years of experience. Founded in 2002 at Madrid, it is specialised in corporate mobile apps and new services. Focusing on B2E and B2C, the apps developed by Movilok are daily used by millions of people in Spain, USA, and Latin America. The company develops custom projects and its own products with last generation technologies related to mobility and connected devices, such as multiple mobile OS, Smart TV, wearables, IoT, etc. Regarding mobile services for corporations, Movilok provides technologic and strategic consultancy in the mobility area, functional definitions of mobile solutions and the full development of apps to be published in the mobile apps markets. Online commerce is experiencing a huge growth since 2000: the 10% of all sales in the US were purchased online, and for the retail sector e-commerce is the segment with the highest growth rate, reaching a 15% per year in the UK. However, according to a research conducted by Veredict Retail and British Land, the 89% of UK consumers still prefer to buy in brick-and-mortar shops, and online–born companies such as Amazon or Bonobos are increasingly opening physical stores. The answer to why the giants from the online world are offering a direct contact to the consumer by opening physical shops may be not unique, but according to the same research, it might have to do with the need of consumers to physically see and touch the products before buying, or their preference to deal with people, mostly when consumers feel the need of assistance. Additionally, problems in delivery & product return, plus the risk feeling on online shopping are still ticks against e-commerce, specially for expensive products. Even digital-born consumers under 35 declared to prefer physical shopping for items costing more $50. Following the subject of competition between physical and online stores, the event “Voices” by fashion-specialist online magazine Business of Fashion held a debate titled How will stores of the future captivate the consumer?. It was a very interesting talk about the challenges of the retail sector in the next years, focusing on the fashion retail stores. There arose the need to convert the physical shops into facilities offering new experiences to consumers, in a way that online stores cannot replicate: sounds, smells, images, games, kindergarten, or event activities for kids such as a cooking school or environmental classes. Creativity and excellence should not be only applied to products, but also to the customers’ experience in the physical shop. Thus, the process of buying is not longer being a direct path from the advertising to the product purchase, leaving way to a kind of conversation between the consumer and the vendor, which enriches both. The main purpose of customers visiting the shop would not be directly customers buying products, but happy customers coming back to the shop again to enjoy the experience. Those recurring visits may generate recurrent sales in the middle and long term. Summarising, the “consumer journey” is changing and the point is how retailers are able to leverage the new journey to set a new relationship with consumers, which may eventually lead to boosting sales, but first requiring a longer and more complex process which may provide consumers with a joyful experience unable to live by alternative shopping methods, making them willing to go back to the physical store.